When I was nine, I wrote a fan letter to Tasha Tudor. For those of you unfamiliar with the children's illustrator who died yesterday at the age of 92, she was as known for her aggressively anachronistic 19th century lifestyle on a New England farm as she was for her delicate watercolors of children and animals. As a pantaloons-wearing third-grade oddball who'd rigged up a fake root cellar in my back yard, the idea that a grown-up could pursue this kind of eccentricity so boldly was very appealing. Born into an old Boston family (about which she talks a lot in The Private World of Tasha Tudor and The Tasha Tudor Cookbook - what, you don't have them?) Tasha Tudor was in fact a hardworking artist who illustrated more than a hundred books and raised four children as a single mother. 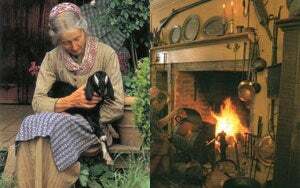 That she lived by candlelight, had hundreds of corgis, spun her own flax, raised goats and chickens and wore clothing exclusively from the 1830s was almost incidental - which is what made it so awesome. Tasha Tudor was one of the last true eccentrics, someone whose peculiarity owed nothing to image (although she was happy to capitalize on it) and everything to individual proclivity. That the larger world found this so appealing is testament not just to the hackneyed yearning for "a simpler time" but, I think, for this kind of rugged individualism. And was she weird! Says the Times, "Ms. Tudor frequently said that she was the reincarnation of a sea captain's wife who lived from 1800 to 1840 or 1842, and that it was this earlier life she was replicating by living so ardently in the past." It's not surprising that she should have appealed to an eccentric child; as the Times (and a 1950s autobiography I cherished) tells us, as a child "she developed a love of times past and things rural, going to auctions to buy antique clothing before she was 10. At 15 she used money she had made teaching nursery school to buy her first cow." So much niftier than sticker books (the fad of the year) and The Little Mermaid! Also appealing to me, she was one of the most prominent unsentimental adult doll-lovers, writing some of the best doll fiction (The Doll's Christmas, Corgiville Fair), owner to a magnificent (1830s style) dollhouse, and host to an elaborate doll wedding covered by Life magazine. Tasha Tudor lived a long and reportedly very healthy life - and no one can say that she didn't live it exactly as she wanted to. It's hard to really be sad when such a life ends - but a part of me still is. While I don't know that burgeoning eccentricity should always be encouraged (I had to wrest myself forcibly into a semblance of normalcy as a teen for the good of my social skills, and it was a painful process), it was tremendously heartening to me as a child to know that in this day and age someone had that much agency in her own destiny, could be that peculiar and still thrive. When I received a hand-written note from Tasha Tudor many months after sending my letter, it was one of the happiest moments of my life, and I still cherish it. That my best friend found and mocked it mattered not one whit - Tasha had taught me that. Enjoy the 1830s farm in the sky, my friend.